Have I mentioned that I love chocolate? I could probably do without any other sweet besides chocolate, but the thought of giving up chocolate is frightening. Over the years I have changed my preferences for what specific type of chocolate I prefer. Growing up I was one of the few people that I knew that loved white chocolate. As the years passed I grew more fond of milk chocolate until a few years back when I feel in love with dark chocolate. Dark chocolate is great for baking and I often substitute it for milk chocolate in recipes. 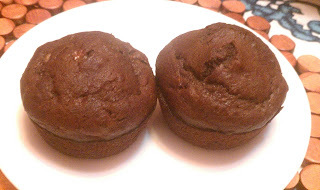 With the heat in the last couple of weeks I was left with a number of over-ripe bananas that needed to be used and came across a recipe for Chocolate Banana Muffins, which looked full of chocolate and delicious. This recipe has 7 ingredients. It takes approximately 25 minutes to prep and bake and makes 12 servings. With only 7 ingredients I had no problems finding any of them at my local grocery store. Instead of regular cocoa powder I used dark cocoa, I feel that the flavor is stronger and more flavorful. I ended up with chunks of banana when the muffins were fully cooked even though my bananas were very ripe. I think next time I would put the bananas in the food processor or blender in order to fully liquify the bananas. Additionally as suggested by some of the other comments on the recipe page I would add some cinnamon if you use regular coca powder. Make sure to watch the muffins in the oven, mine were done at exactly 15 minutes. I followed the remainder of the recipe as stated. I love combining chocolate and bananas in baking recipes. This recipe is very easy to make and a great way to use over-ripe bananas. My youngest son thoroughly enjoyed these muffins and ate two of them as soon as they came out of the oven. I like that they have the nutrition of the bananas and the dark cocoa provides a great taste. The next time I make this recipe I think I would add chopped dark chocolate or dark chocolate chips. It would provide an every stronger chocolate flavor and be delicious. For the recipe go to Chocolate Banana Muffins. Oh my goodness! Just visiting your blog and now I am leaving hungry! Thanks for sharing! Thanks :) I hope you come back again soon and find some recipes to try! I agree, giving up chocolate would not work for me! I hope you like the recipe when you try it! Oh god, oh god, oh god! I LOVE chocolate and bananas! am so doing this!! I like chocolate and banana together also. I'm not a fan of uncooked bananas, something with the texture, but I love them cooked and baked. Thanks for stopping by my site and joining the GTKY Blog Hop. I'm a new follower. Sounds great! I am a big chocolate fan also, yum! Thanks, followed you back :) Don't know why my facebook page said that, it has been doing something weird lately, thanks for the heads up! Woe. Chocolate muffins with only 7 ingredients? Sounds deadly delish! Thanks for sharing. I am attempting the weekend bloghop :). I haven't created a button yet (I'm a bit of a newbie to the blogoshpere and motherhood :)). They really are easy and delicious! I followed you back, have a great weekend! Love chocolate too! I also really miss Nigella's TV show. I have one of her books. I have one of her books also, I like her since she seems down to earth on tv. Thanks :) I hope you like the recipe if you try it! Super that you linked in. Hope you are having a great day. Thanks for linking it up :) Going over to check out the other recipes!